As 2017 comes to a close for our Zieggy Tribe, a major component of our company’s Zieggy Essentials stands out. The “S” in TWINS stands for “Serve Others!” That’s exactly what our Zieggy Tribe did at the company meetings held earlier this month for each plant location. Wheeling’s efforts benefited weServeEats, an organization that coordinates the creation of individualized meal packs. The tribe also created hygiene kits that will help people affected by natural disasters. 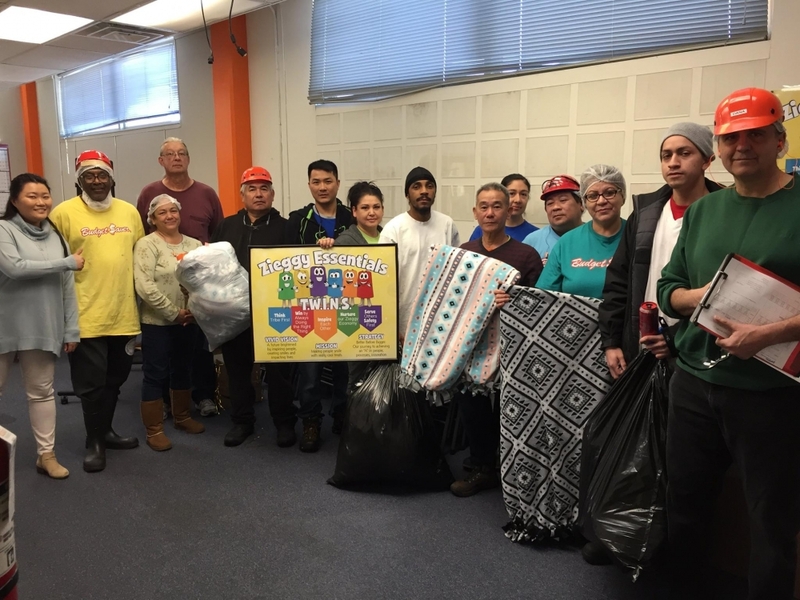 In Denver, tribe members made roughly 80 blankets and donated them to A Precious Child. The organization provides opportunities and resources to children in need to help them overcome obstacles related to education, poverty, crime, and wellness. Steven’s Hope For Children received Love Boxes thanks to the service project completed by our Chino tribe. The Love Boxes will go to children who are seriously ill or injured, and staying in hospitals in southern California. With the overwhelming success of community service projects during the company meetings in 2016 and 2017, the Zieggy Tribe will head into 2018 with a new committee formed to organize external donations and service projects. The committee is being called the Zieggy Impact Group, or ZIGs. 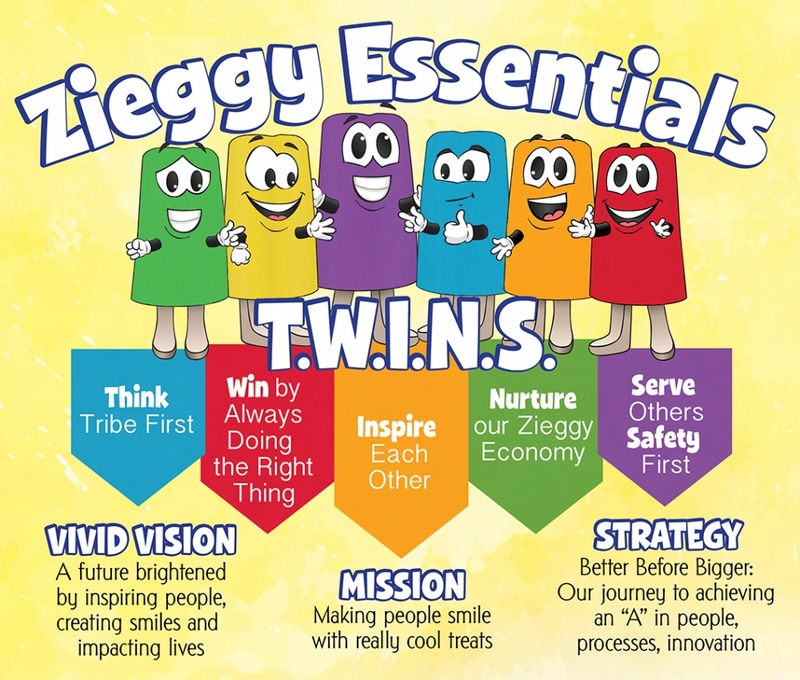 The group will help coordinate various opportunities across all Ziegenfelder locations to stay true to the “Serve Others” message included in the Zieggy Essentials. It’s driven by a mission of being a catalyst for positive change through charitable contributions, volunteerism of the Zieggy Tribe and making people smile with really cool treats. Anyone who is currently a member of the Zieggy Tribe is encouraged to join the ZIGs. Please reach out to me through email at kgreathouse@twinpops.com or by going to the main office at any plant location. The staff at each facility will be able to put you in contact with me. Starting in mid-January, all donation requests will be accepted through the company’s website, budgetsaver.com through an online form. Organizations that make a request are asked to submit the proper information 60 days prior to needing the donation to allow ample time for the committee to evaluate the request. Questions about this process can be submitted through email at kgreathouse@twinpops.com. Our entire ZIGs committee is excited for all the opportunities that will come from impacting lives and creating smiles through this new group. Serving others will take on a whole new level in 2018.